Like many of his fellow officers, Captain David Collins who became the Colony’s Judge Advocate, took convict women as mistresses during his years in Sydney Cove and Hobart Town, Van Diemen’s Land. One of his mistresses was convict milliner Nancy / Ann Yates / Yeates. She was tried as a single-woman aged 17, at Yorkshire Summer Assizes held at York on 9 July 1785 with Jonathan Howard for burglary. Breaking and entering into the dwelling of John Strickland in the township of Milton on 7 February 1785, they stole thirty-six yards of printed Cotton, value £5, being the property of George Crumbie. The sentence was passed Guilty Grand Larceny without the benefits of the Statue. To be hanged. This was later commuted to 7 years transportation on 17 August. 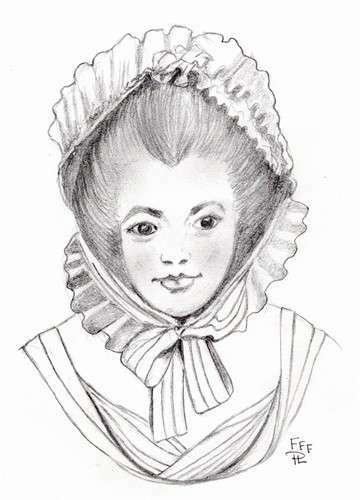 Held over in gaol until ordered to the New Gaol, Southwark on 26 November 1786, whence she was sent to Gravesend with a group of women prisoners collected in gaol and embarked on Lady Penrhyn on 31 January 1787. She was then recorded as 19 years old. Nancy was amongst the women chosen to go to Norfolk Island with Phillip Gidley King on 14 February 1788. Arthur Bowes Symth noted : Ann Yates was recommended as a very fit person to go, having uniformly behaved well during the whole of Voyage, But wish rather to continue where she was – another was fix on her on in her room. During the voyage Nancy had a relationship with Seaman Joseph Theakston. Surgeon Bowes Smyth recorded Joseph Theakston as being born on the voyage although his name does not appear in any of the Victualling Lists. He was baptised on 16 March 1788 in Sydney Cove; this may have been a factor in Nancy not wishing to go to Norfolk Island. The child possibly died in infancy. The next we hear of Nancy is when Marianne Laetitia Collins was born on 13 September 1790, fathered by Judge Advocate David Collins. Their son George Reynolds Collins was born on 25 April 1794; both births are in St Phillip’s Register. After nine years in the Colony Collins was preparing for his return to England. He departed on 29 September 1796 aboard Captain Raven’s storeship Britannia, stopping off at Norfolk Island to collect Lieutenant Governor King and his family, who were also returning to England. Collins was leaving a 5 year old daughter Marianne Laeticia and 3 year old son George at Port Jackson with their mother Ann Yeates (sic). Before leaving Collins had granted his 100 acre Willow Farm to Nancy. Collins was kept busy in England with his wife and publishing The Account of the English Colony in New South Wales, and in 1803 was commissioned Lieutenant Governor of the proposed new settlement in Bass Strait. He arrived in Sullivan’s Cove (Sorrento Victoria), aboard Calcutta. In St John’s Parramatta on 13 November 1800, Nancy had married the Scottish convict and former lawyer James John Grant (Surprize 1794). Two years later in November 1802, Willow Farm was conveyed to John Palmer for £157.10s. The notation appearing in the register: granted to Nancy Yates by David Collins Esq. On 10 April 1812 James Grant died at Castlereagh Street Sydney. His death went to the Corner’s Court. Taking into account the alteration James had with his servant their verdict was Death by the Visitation of God. David Collins maintained an interest in his children by Nancy, both visiting him in Hobart following the aborted settlement at Sullivan’s Bay (Sorrento Victoria). Their visits were well recorded by the Reverend Knopwood. Marianne married Samuel Rodman Chace (Chase) a sea captain and trader; she returned to Hobart settling there with her children after the death of her husband. At a young age George became midshipman in the Navy, enlisting 26 November 1805 on Buffalo. He was on Porpoise in 1806 when it sailed into the Derwent with Governor Bligh and was still serving on Porpoise in 1810. George was in England at the time of his death aged 25. It is noted that he was very anxious to return to his mother in Sydney.